After a dry spell we are back to showery, mild weather typical of Ireland. The rain makes things grow, and not just the vegetables, but the slug populations, and weeds too. One finds oneself in a constant battle of wills. Thankfully the frog population is healthy and at the moment we are seeing lots of tiny frogs less than 1 inch long! In late June, there always seems to be a huge spurt of growth, from grass, hedges and trees. Pathways would soon disappear and gates and gaps would close in, without some clipping and mowing. In many respects we are just trying to tame nature. Without us this garden would soon become a truly wild place. Among the flowers pollinators are busy and I hope happy. Tonight in Ireland, 23rd June, is St. John’s Eve. A midsummer festival celebrated with bonfires at sunset. It is not a tradition that is widely celebrated any more, which is shame. So tonight I will celebrate with the joys of midsummer – some of the flowers! HAPPY MIDSUMMER one and all. This entry was posted in Garden and tagged bees, bonfire night, bumblebees, flowers, Ireland, nature, St John's Eve, wild pollinators on June 23, 2016 by Murtagh's Meadow. Last week we saw an adult Long-eared owl around the garden. It was around 11pm – and nearly dark. This morning when my husband was opening the blinds in the kids bedroom, he spotted an owl on a fence post near the polytunnel. Of course we all gathered around and it was wonderful for the kids to see the owl though it was far off. This time it was obviously a young bird. Nearly the size of an adult but all feathers – like a puffy ball!! With binoculars we could see it amazing orange eyes. While we were delighted to see the owl, the garden birds were not. It was being dive-bombed by swallows. Blackbirds, thrushes and other small birds were all alarm calling all around it. I wondered that it was happy to sit out in the open as it was! Long-eared owls are native to Ireland and are quite widespread throughout the country. It has two distinctive ear tuffs (they were only just visible on this young bird, but very obvious on the adult seen last week). The young have a a high-pitched squeak reminiscent of a rusty gate opening and we have been hearing this on and off late at night (about midnight) for the last few days. The adults can give a low hooting display (which we haven’t heard). They hunt small mammals, frogs and small birds (hence the fuss happening with the garden birds this morning). They like nesting in conifers and while many of the conifers around us have been felled a small patch remain, so they may have nested there. More information and a for a better photo take a look at the BirdWatch Ireland website. This entry was posted in Nature and tagged garden, Long-eared owl, owl on June 20, 2016 by Murtagh's Meadow. This entry was posted in Nature and tagged bees, bumblebees, Silent Sunday on June 19, 2016 by Murtagh's Meadow. I sometimes keep a list of what I am reading but haven’t done so this year, but a quick count in my head has brought me to 7, which is about half way. I love fiction but have read two excellent natural history books so far this year. Dave Goulson’s “A Buzz in the Meadow” and Michael McCarthy’s “The Moth Snowstorm” which I do intend to do a blog about very soon. Not doing that well on this one. Found a lovely bit of drift wood. I gave six lupin plants to a friend a couple of weeks ago (and didn’t actually think of the challenge when I did it), I have also give my mother 3 (I think), and I gave my sister a couple of tomatoes plants, and just remembered gave a friend some romaseso seedlings – does that count. That would make 16! Brought kids to Enniscrone, Moorehall, Feile na Tuaithe at Turlough House, and to the beach at Ross (but summer holidays still to come when we will hopefully have some more). I did my fourth one on the 2nd June, so a little behind. 9: Try nine new recipes. I’ve tried a couple of cake recipes but they don’t really count. But have tried one from the Happy Pear cookbook which everyone liked, a sort of potato and fish curry. Now I have been picking my youngest up from school on the bike the last couple of weeks but I don’t think that really counts. We did have one ride around our country lanes though, but way to go on that one! 7: In addition to number 2 below have seven Mayo days out to some of my favourite Mayo places. Oh dear falling short on this one – though I did make my father a birthday cake – does that count? 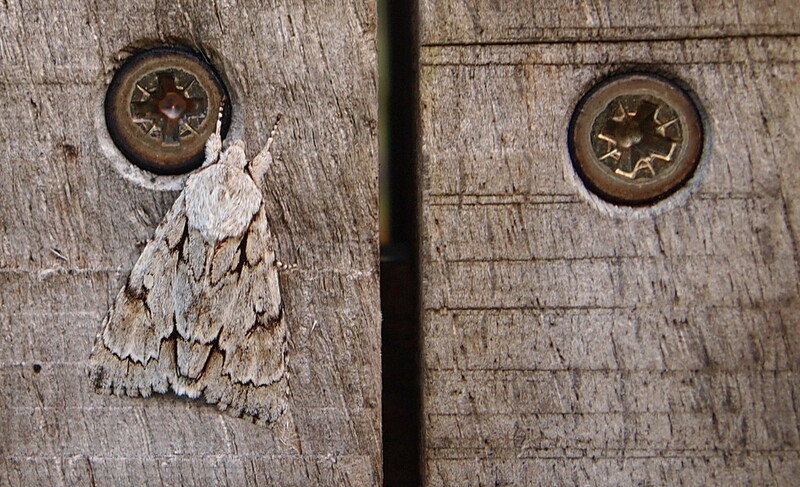 Actually the Grey Dagger moth (see above) would count for this one. The long eared owls we had about ten years ago but not since, so also nice record for the garden. This entry was posted in Life and tagged 16 for 2016, books, challenge, garden, nature, personal goals, Wildlife on June 15, 2016 by Murtagh's Meadow. This entry was posted in Nature and tagged camouflage, Moth, Wildlife on June 12, 2016 by Murtagh's Meadow. Over the last couple of years I have been trying to increase the number of flowers in the garden, specifically to help our pollinators but also for our own enjoyment. 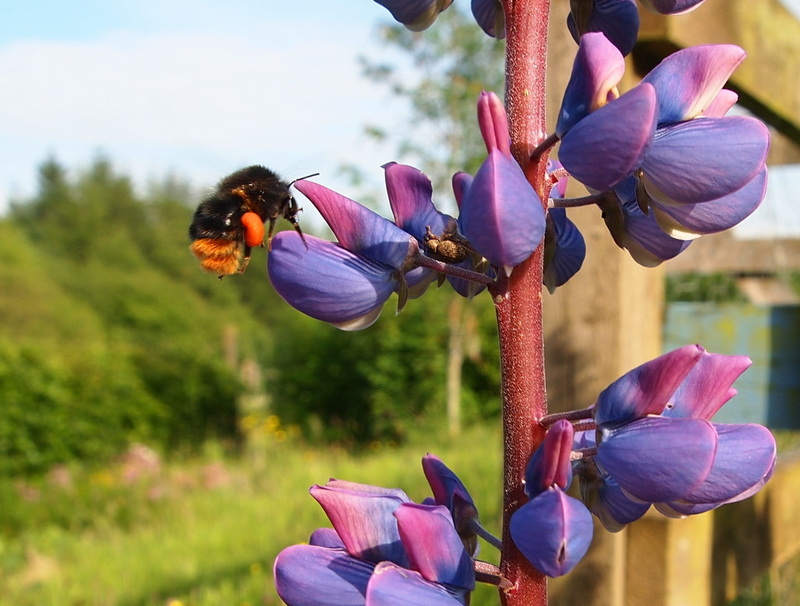 Flowers add so much – colour, scent and of course the fun of watching bees, butterflies and other insects. My wildflower success this year has been ragged robin. I have always loved this flower and two years ago bought some wildflower seed as I wanted it around our pond. The seeds didn’t germinate very well but I gather seed last year from the couple of plants I did manage to grow and these germinated brilliantly. So I had enough plants to try some in the meadow too, where I thought it may be a bit dry but where they seem to be doing well despite the lack of rain. Buttercups seem to be doing particularly well this year and many fields around us are yellow with them. Meanwhile the bee and butterfly garden is proving attractive to bees but not so many butterflies yet! Some of the delphiniums have suffered slug damage so I may need to grow a few more. Other flowers include these lovely heritage roses which clamber though the hedge. They are heavy scented. And the blue irises by the pond always seem to do well here though I have tried to grow them elsewhere in the garden and they disappeared after one poor year of flowering. 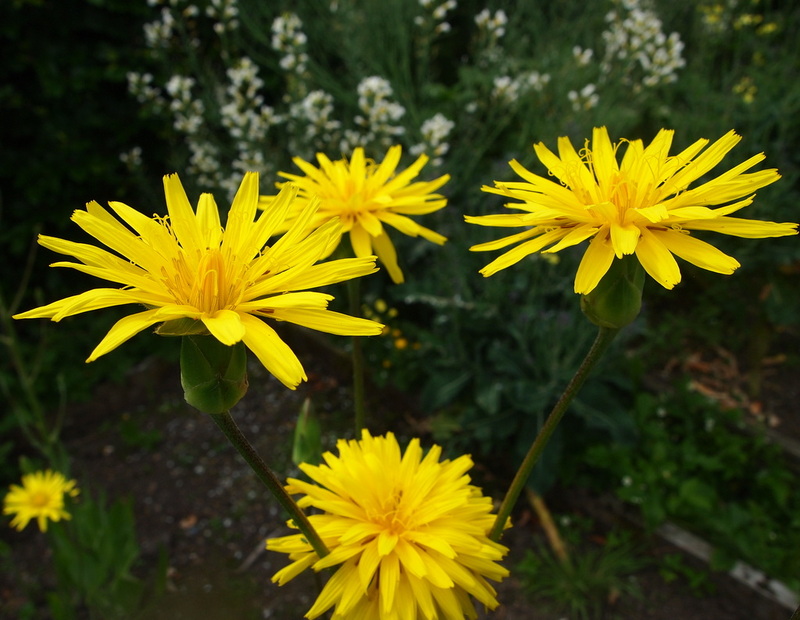 Finally this flower is actually a vegetable – scorzonera. I tried growing last year as a veg but again had poor germination so thought I’d leave a few plants in the ground and see if I could get seed. They have rewarded me with lovely yellow flowers that smell of marshmallows. 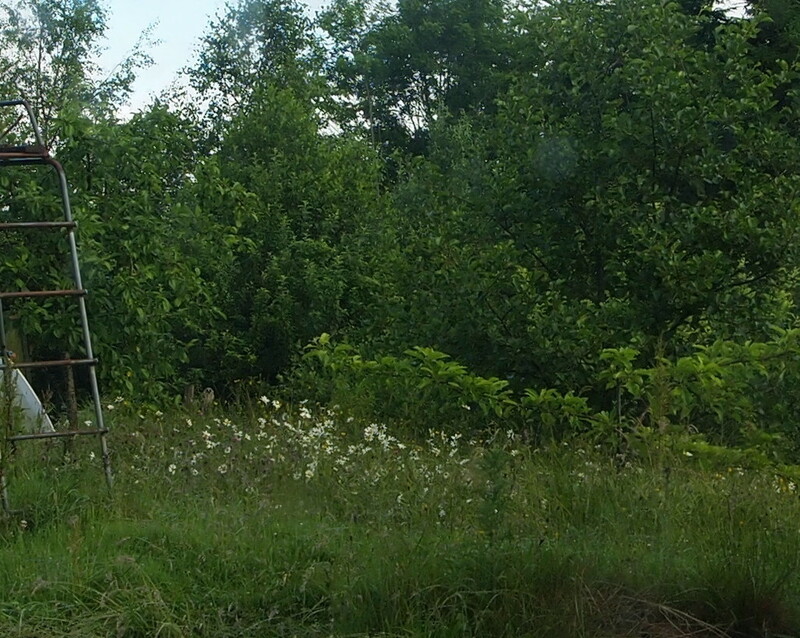 The flowers grow on tall stalk about 60-80cm high. This entry was posted in Garden and tagged bees, butterflies, garden flowers, nature, pond, wild pollinators, wildflower, Wildflower meadow on June 9, 2016 by Murtagh's Meadow. Well things are busy in the garden this month but at least we are reaping some of the benefits. We’ve been enjoying broccoli from the greenhouse from over wintered plants, which are being gradually cleared out and replaced by cucumbers and tomatoes, and also a few early beans. We’ve also had a few early strawberries, and the first courgette is just coming. 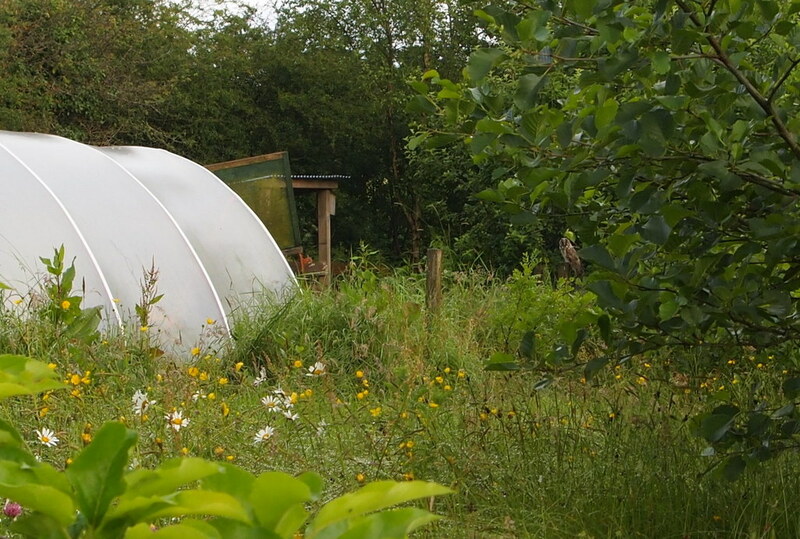 In the polytunnel things are getting a bit overgrown, as the early potatoes need to start coming out. The broadbeans have cropped well and we are enjoying them for dinner. The mange tout seem to have suffered from our recent dry and sunny spell as I think they prefer cooler conditions, so leaves are looking a bit yellow but they are still producing peas. Outside plums are forming as are some pears and apples – though I am a bit concerned that the pears are already looking a bit scabby. In the vegetable garden things are a little slow. Cabbages though have benefited from the warm weather as there has been minimum slug damage. Beans and onions are just coming slowly. I am gradually catching up with weeding but they seem to continue to grow!! This entry was posted in Garden and tagged beans, fruit trees, greenhouse, peas, polytunnel, vegetable growing, vegetables on June 8, 2016 by Murtagh's Meadow.